Keleti Station re-creates the Budapest train station in where thousands of refugees, many from Syria and Afghanistan, were stranded on their way to Germany, Sweden, and other European destinations during September 2015 when Hungarian authorities shut down Budapest’s Keleti Railway Station, denying refugees with tickets access to the trains. The installation was created over the course of eight days on-site in the Real Room at Real Art Ways with classically prepared egg tempera. 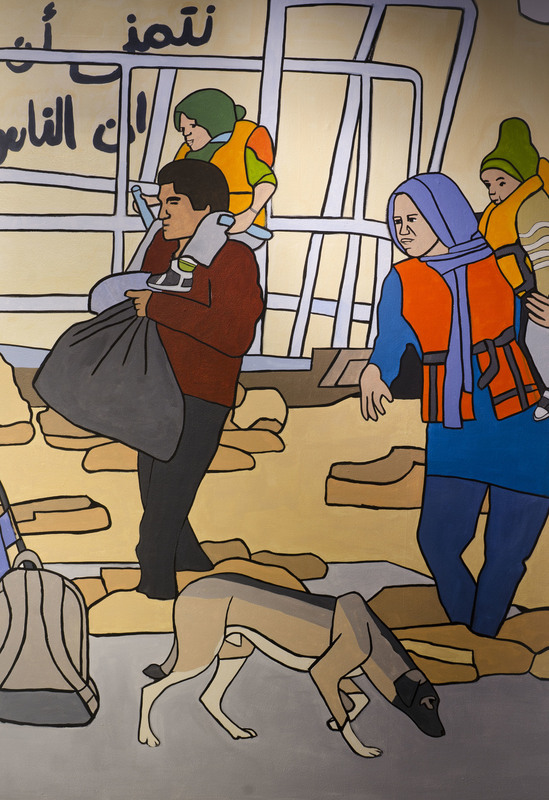 Set in the underground transit zones of Budapest’s Keleti Railway Station, this work is a composite of images and accounts of the West Balkan migration route taken from traditional and social media during that period, including anti- and pro-migrant graffiti and disparate first-hand accounts. Our media landscape puts us in contact with a sea of fragmented and stratified documentations that come forth on social media platforms filtered by chance as well as by multiple, calculated and unknowable internal dialectics and interests. How do we process, recompose and interpret this multitude of information? Do we have a responsibility to attempt to assemble this information for ourselves? What are the outcomes of our interpretations? Main gallery wall view, 14 x 3.5 mt, egg tempera, 2016. Click on image to view or download PDF of exhibition catalog. 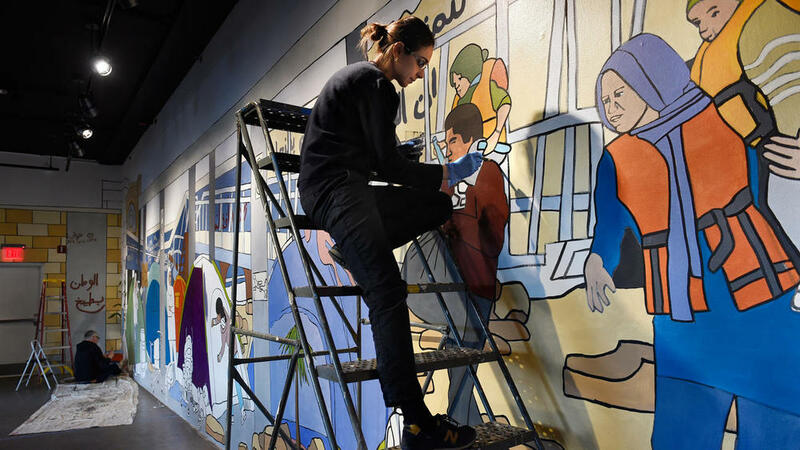 Special thanks to Kifah Abdulla, Noura Akkad Kaya and Angeliki Douri for their assistance in translating the graffiti used in this exhibition. Thanks to Karyn Thomas and the Small Projects Istanbul for Syria students and families for welcoming me into their community. To learn more about Small Projects Istanbul for Syria and how you can help visit www.smallprojectsistanbul.org. Thank you to my husband Giuliano Matteucci, and to Daniela Salvati and Domenico Matteucci for their support. Finally, this project would not have been possible without the painting students from the University of Hartford, Alex Ranniello, Victoria Burnham and Quentin Shapiro, and the many volunteers and friends from the community who made this project come to life. Thank you to Marcy Balint, Brad Allison hosting me during the installation, and to Zoe Allison and the amazing team at Real Art Ways for facilitating this project.